As a Sales Agent, his tasks are demanding and tiring. Starting his day, by meeting the clients, closing the deals and recording the numbers, he has quite a hustling day. And at the end of a long tiring day, he patiently needs to sit down and log his proceedings. Due to his taxing work, he forgets or postpones his logging time. So when he is not able to put down his long-day hard work, his whole team takes a beat. Because right from his supervisors to Boss, expects the numbers on-board. So to cut down this situation, to have a smooth workflow, we have Mobile CRM. Carry your tasks, as you are on the move and put down the numbers to satisfy your team. 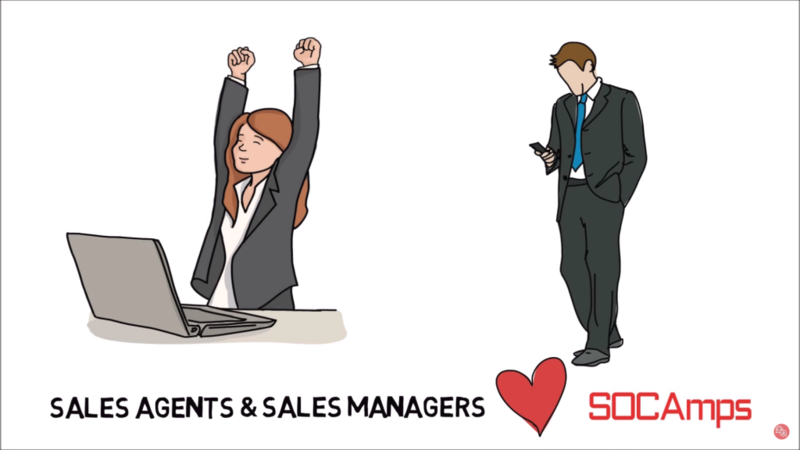 Especially with our SOCAmps Mobile CRM, a couple of touches on your screen is enough. The Keywords are automatically chosen, through your entry and you just have to approve it. Also the flexibility to update your CRM anywhere, will keep you on the track. The added advantage is that, you will have the clarity to make your next step and go with a flow. Besides, at the end of the day, you will have those ambitious and fancy reports to look at. More importantly, that you will have a contented Boss when the numbers shimmer on his screen. So without any delay, Try our SOCAmps CRM now. Also we have guide video to show how it works. Learn about its Top Features and here is the starting guide to assist you to start with your sales right way.